At a time when some dealerships are charging nearly double the MSRP for a certain other low-production car, Fiat Chrysler has its own plans for the 2018 Dodge Challenger SRT Demon—and, basically, the buyers who pay the most over MSRP will be last to get the car. Dodge already expected the 840 horsepower Demon, priced at $84,995 MSRP, would get some thorough price gouging from dealers once orders begin on Wednesday. The company made a personalization system for ordered cars to attempt to discourage dealers, but the plan FCA announced Tuesday said Dodge will take some additional, stranger approaches to discouraging markups. Our resident car-buying expert Tom McParland said a customer typically pays once a car arrives rather than at the time of the order, which would make sense in discouraging dealerships from markups—we can almost all agree that the sooner the cash comes in, the better. If that’s not the case with the Demon, well, the higher-paying customers simply get to pay to wait. That’ll teach ‘em to spend $100,000 on an automatic that goes straight. 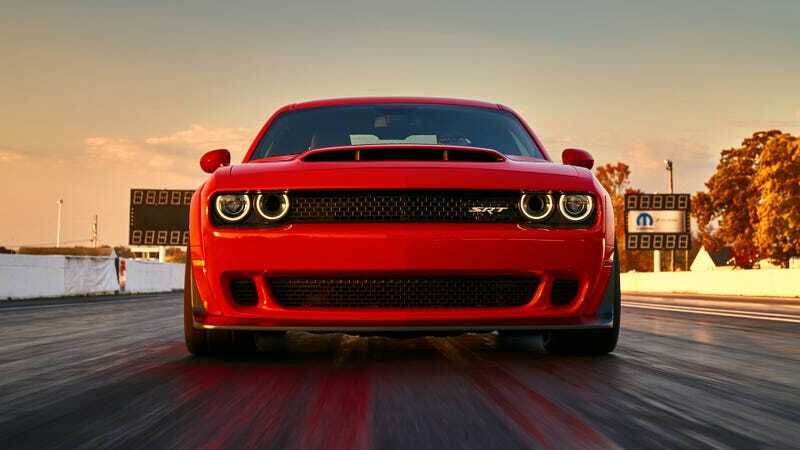 So, if the people in your area love high-horsepower Challengers, you’ll be in luck. If not, who knows how many Demons—if any—will be available nearby. Good luck to the folks who like driving in straight lines really fast, and happy price haggling. Looks like you’re in for a fun one with this car.